If you have been in a bar, store or restaurant in the last few years then you are probably familiar with Holy Mackerel. This Florida based beer company has been making quite a name for itself over the last few years, not only in Florida but also around the country. I decided to talk to the man behind the beer, Bob Gordash, about how he got to where he is today and what he has going on in the future. South Florida Beer Blog: What is your position at Gordash and what do you do? Bob Gordash: I am the Founder and President of Gordash Beer Company, and as such I test brew every beer that we plan on bringing to market. I also am largely involved in the marketing, sales, and promoting of Holy Mackerel beers. SFBB: When did the brewery open and how did you get into brewing? BG: We started business about 3 years ago by bringing to market my Holy Mackerel Special Golden Ale which I had already been brewing for about 10 years and tweaking during that period. I got started brewing about 15 years ago by picking up a small kit from the Sharper Image store here in South Florida. SFBB: How long have you been brewing beer? BG: For about 15 years, reading every thing I could get my hands on about the craft and touring many breweries throughout the United States and getting tips from many of the brewers. SFBB: Did you work in the beer industry before you started brewing and if so, how did it help you in the position you are in now? BG: As I mentioned I have been brewing for 15 years, but only formed my brewing company 3 years ago. I work for a local beer distributor that specializes in craft beers for about 5 beers and this has helped educate me as to the marketing and sales aspect. SFBB: Do you remember the first beer you brewed? Was it any good? BG: The first I ever brewed was a Canadian style ale that I brewed using the Sharper Image kit that I purchased. I was amazed that the beer turned out good, not excellent, but it tasted like beer. SFBB: You only have Holy Mackerel and Mack In Black right now. Any plans on adding new beers anytime soon? BG: Yes, I plan on a new beer for early 2010. All I can tell you is that it will be another strong Belgian style ale. SFBB: What is the process for deciding on new beer recipes? BG: The process for deciding a new beer recipe for me is the same as a good solid musician has to decide what music to produce on his next album. First and foremost the music has to be something the musician enjoys,but that has to be balanced with something that is marketable. So it’s much the same with our company we’re not going to brew anything that doesn’t get us excited. At the same time, this is a business and we have to balance that by brewing something that we know is also exciting for the public. I have always loved brewing and drinking the beers of Belgium and in my 15 years of brewing I found that many of my friends who were not familiar with craft beers or Belgian beers also truly enjoy them. SFBB: You just moved the brewing of the beers from Florida Beer Company in Melbourne to Thomas Creek in SC. Any reason for this? BG: Actually we continue to use both breweries. Our Mack in Black is still brewed in Melbourne and much of our special golden ale in draft form is still brewed in Melbourne. The change that we made was that our special golden ale bottles are now being brewed at Thomas Creek Brewing in Greenville, South Carolina. One of the main reasons we made this change is that we always wanted our golden ale to be bottled unfiltered and the way that Florida Beer Company is set up it’s just not possible to do this, but by using the Thomas Creek Brewery we are able to keep our golden ale almost identical to the draft version because it now is unfiltered and unpasteurized. We also like the fact that we have 2 breweries that know how to make our beer and because this helps us meet with the demand and also helps some states save on shipping costs depending on their location. SFBB: Do you ever plan to have your own brewing facility? BG: This is something that we have always thought about and it is still in the back of our minds, but we feel that first and foremost we need to focus on the sale and marketing of our beers and our next step in that direction would be adding sales people before adding a brewery. SFBB: In what states are your beers distributed and do you have plans to expand to other states? BG: Our beer is distributed in Florida, Georgia, Alabama, Louisiana, North and South Carolina, Philadelphia, New Jersey and Delaware and our next step believe it or not is Oklahoma because of requests that we have had from there and also because we have a sales person already in place. SFBB: What sets your beers apart from others? Of course today there are lots of excellent craft beers available that are full of flavor as well. In fact we enjoy drinking many of them. But still Holy Mackerel beers are set apart from them as well because we strive to do things that are unique, different and daring. We love to play around with spices, for example. And our idea behind Mack in Black was producing an 8% black ale that really doesn’t fit into any style. It looks much like an Imperial Stout but it’s definitely not. It’s much drier and it has a subtle touch of pomegranate. SFBB: What are some of your favorite beers besides your own? BG: Recently I had Sweetwater Brewing’s Creeper which was a Belgian style IPA and that really stands out as one of the best beers I have had in a long time. I also enjoyed their Big Belgian Blue Balls which is a strong Belgian ale made with blueberries. Of course some of my favorite beers are Belgian beers like Westmalle Trippel, Chimay White Label and Belgian style beers like Avery Salvation and Allagash Trippel. Of course I enjoy many styles of beers and some other beers that I enjoy are Avery IPA, Smuttynose IPA, Avery Maharajah and Victory Prima Pils. SFBB: Can we look for you at any beer fests that are coming up? BG: Yes, all of them. City Link has a beer festival the end of November that we will be attending, the very beginning of December we’ll be attending a beer festival in downtown West Palm Beach and in January we will be in Jupiter for the Jupiter Beer Festival and also Total Wine and 93 Rock are sponsoring a beer festival February 26, 2010 at Gulfstream Park, not to mention the we’ll also be at the World Beer Festival in Columbia, South Carolina and Raleigh, North Carolina in the early part of 2010. 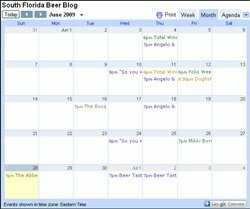 SFBB: What do you think of the South Florida Beer scene? BG: I think it has no where to go but up. More and more people in South Florida are catching on to great IPAs, double IPAs, strong Belgian ales and realizing that beer is not just for guzzling but can be savored and enjoyed sip by sip. Also, many are realizing that beer can be just as good if not better then wine when paired with many fine foods, cheeses and the like. Stage 84 for example in Davie is doing a Beer and Cheese pairing on Friday November 13th, which will include our beers. SFBB: If someone wanted to be a brewer one day what advice would you give them? BG: If somebody wanted to brew for a hobby, I would say go for it. It’s a lot of fun being creative and seeing the rewards of your creativity and sharing that with others. But if someone wants to become a commercial brewer, I would say the same thing but I would add 3 words, patience, patience, patience. Be prepared to wait for the pay off. This is something that we have always been prepared to do and we have no problem with it because we’re having fun every sip of the way. BG: I encourage everyone to support their local brewers. Besides ourselves there are other local brewers that are producing excellent beers of different styles right here in our back yard and although they may be using someone else’s facility to produce the beer it doesn’t discount the fact that it’s their expertise, creativity and imagination that create these works of art.